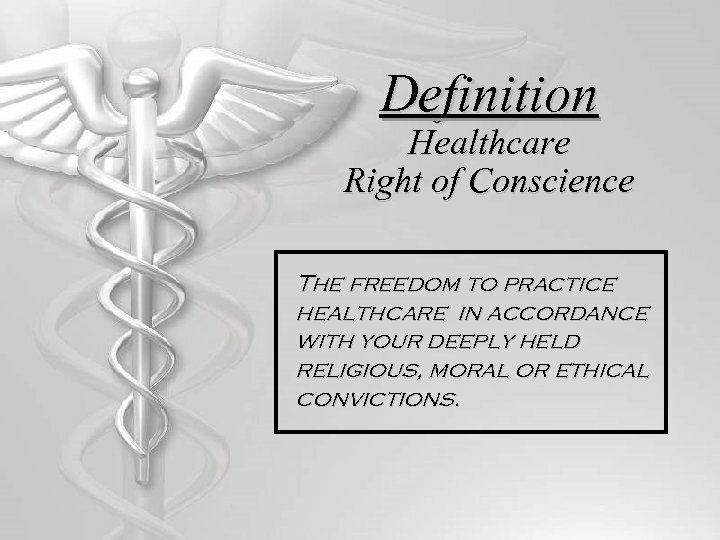 Definition Healthcare Right of Conscience The freedom to practice healthcare in accordance with your deeply held religious, moral or ethical convictions. 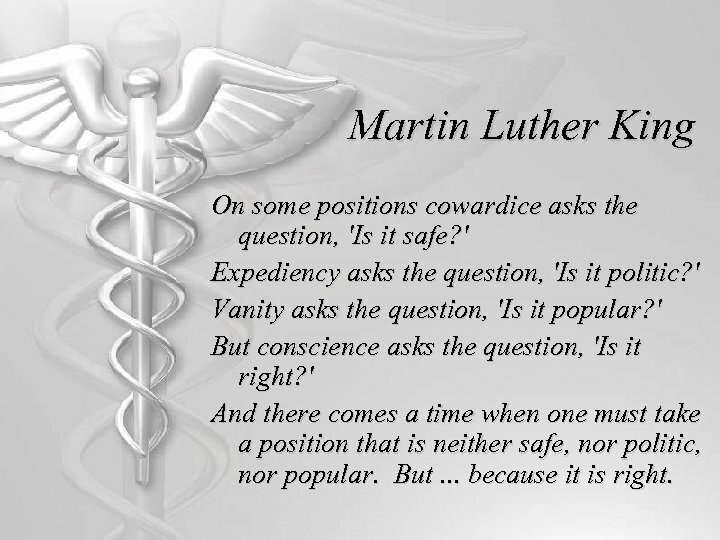 Martin Luther King On some positions cowardice asks the question, 'Is it safe? ' 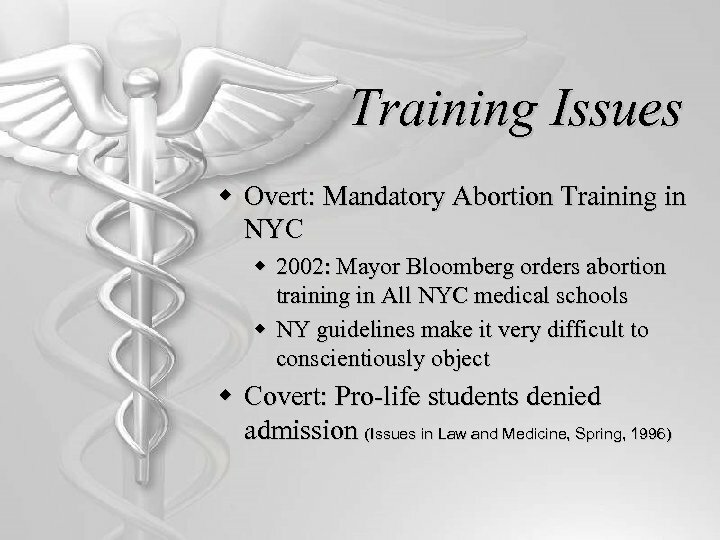 Expediency asks the question, 'Is it politic? ' Vanity asks the question, 'Is it popular? ' 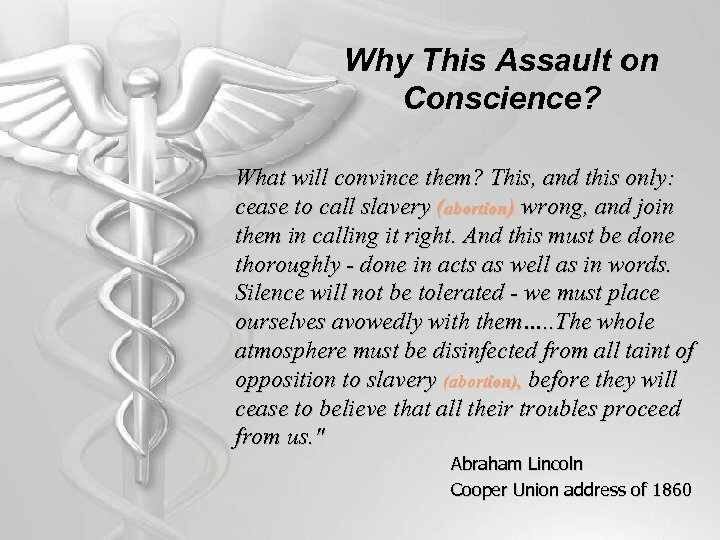 But conscience asks the question, 'Is it right? ' 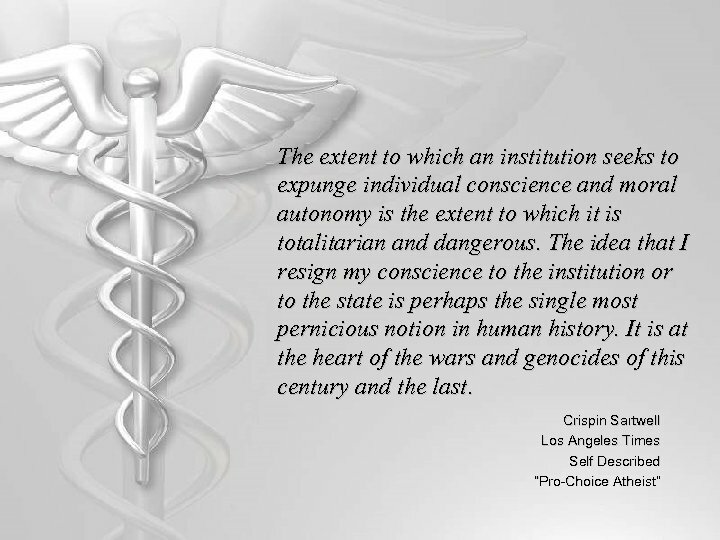 And there comes a time when one must take a position that is neither safe, nor politic, nor popular. But. 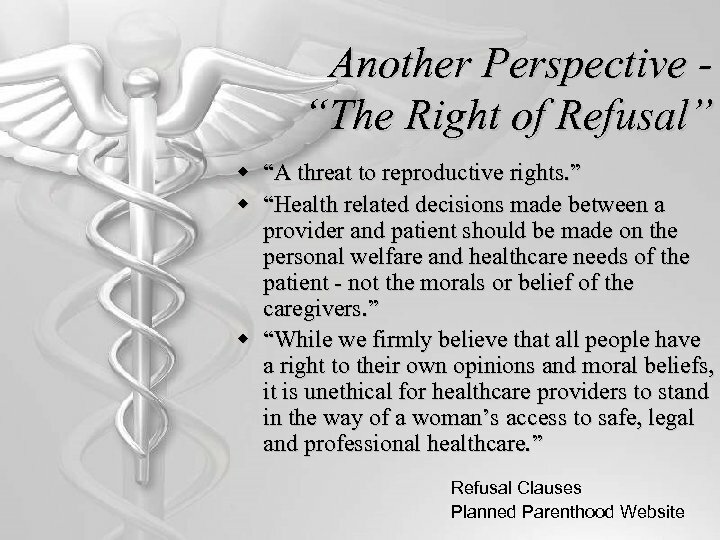 . . because it is right. 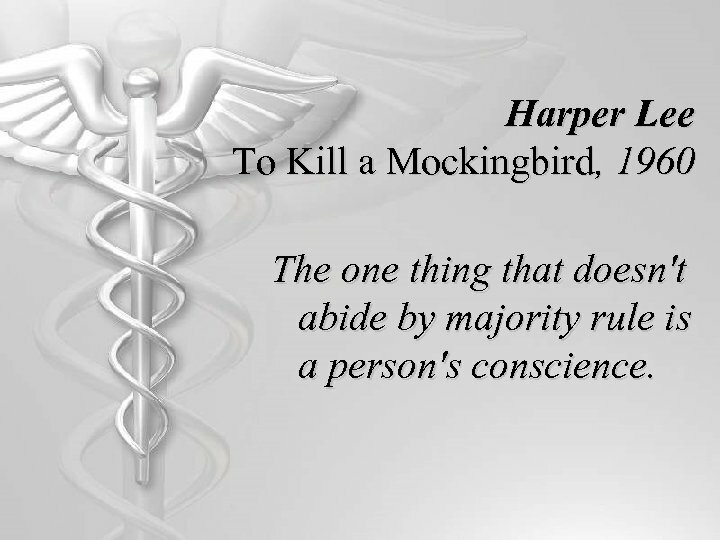 Harper Lee To Kill a Mockingbird, 1960 The one thing that doesn't abide by majority rule is a person's conscience. 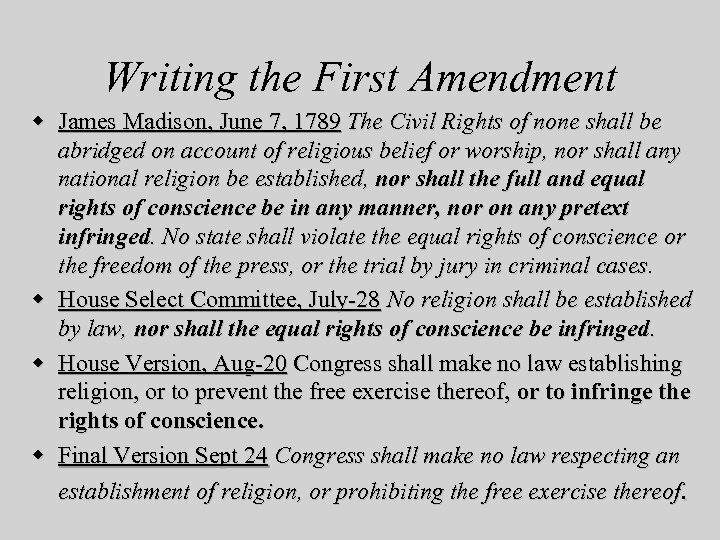 Writing the First Amendment w James Madison, June 7, 1789 The Civil Rights of none shall be abridged on account of religious belief or worship, nor shall any national religion be established, nor shall the full and equal rights of conscience be in any manner, nor on any pretext infringed. 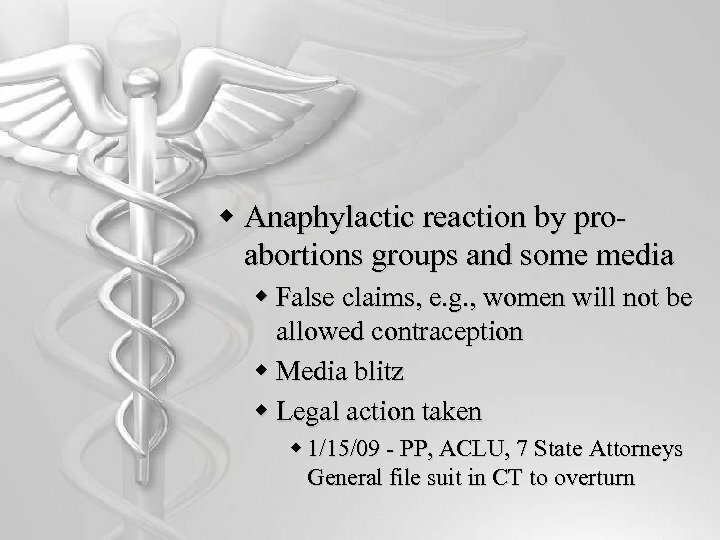 No state shall violate the equal rights of conscience or the freedom of the press, or the trial by jury in criminal cases. 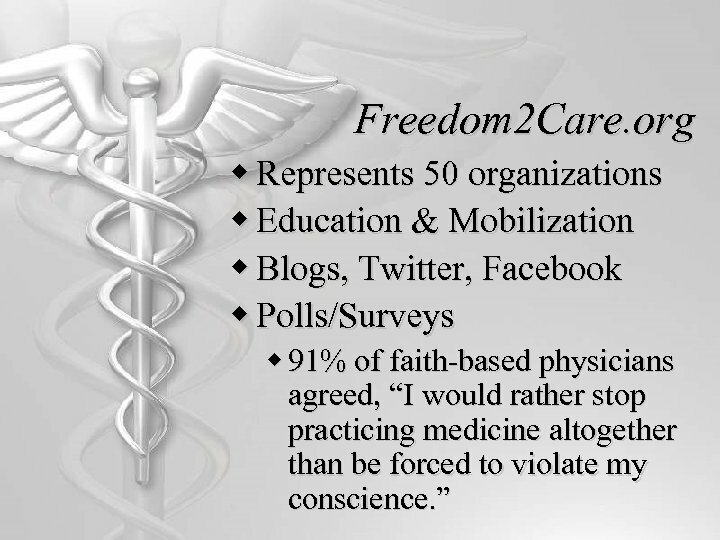 w House Select Committee, July-28 No religion shall be established by law, nor shall the equal rights of conscience be infringed. 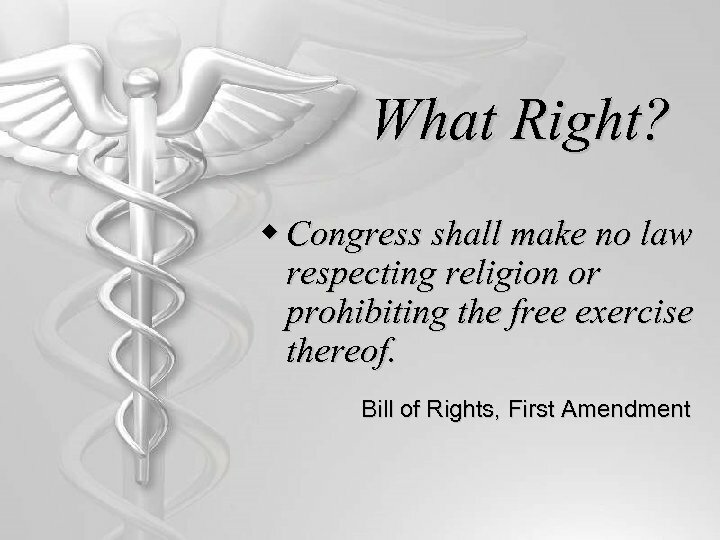 w House Version, Aug-20 Congress shall make no law establishing religion, or to prevent the free exercise thereof, or to infringe the rights of conscience. 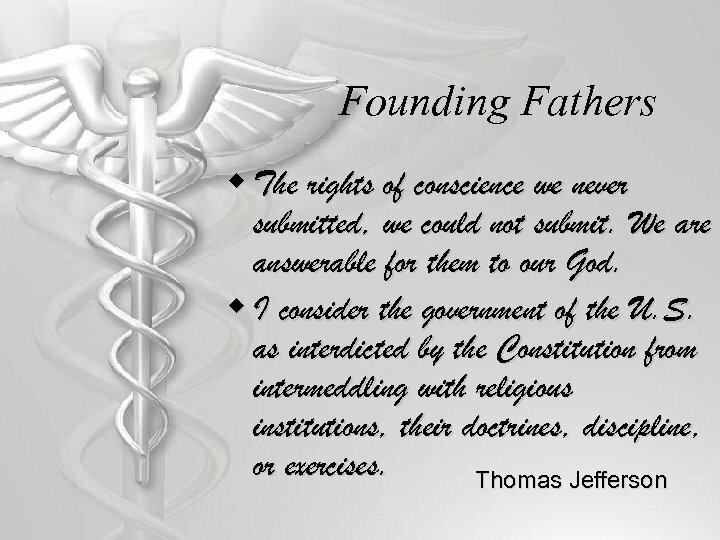 w Final Version Sept 24 Congress shall make no law respecting an establishment of religion, or prohibiting the free exercise thereof. 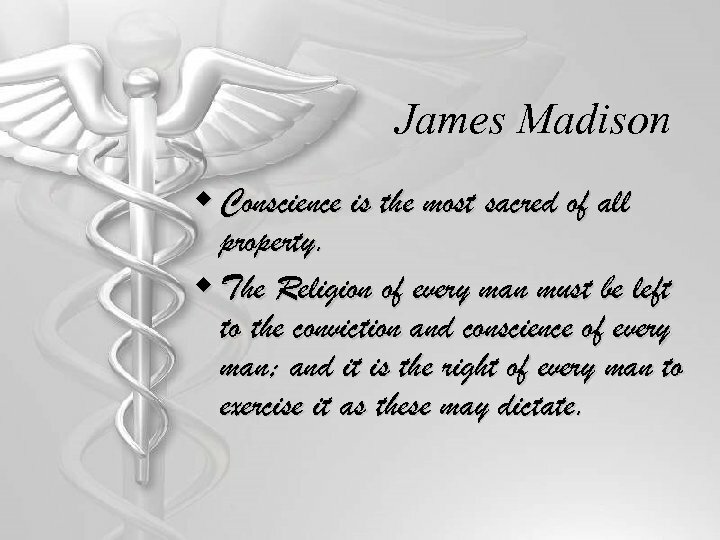 James Madison w Conscience is the most sacred of all property. 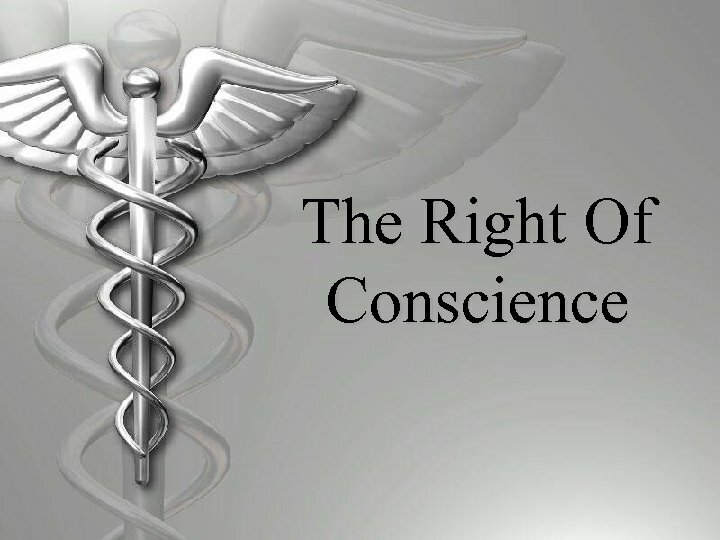 w The Religion of every man must be left to the conviction and conscience of every man; and it is the right of every man to exercise it as these may dictate. 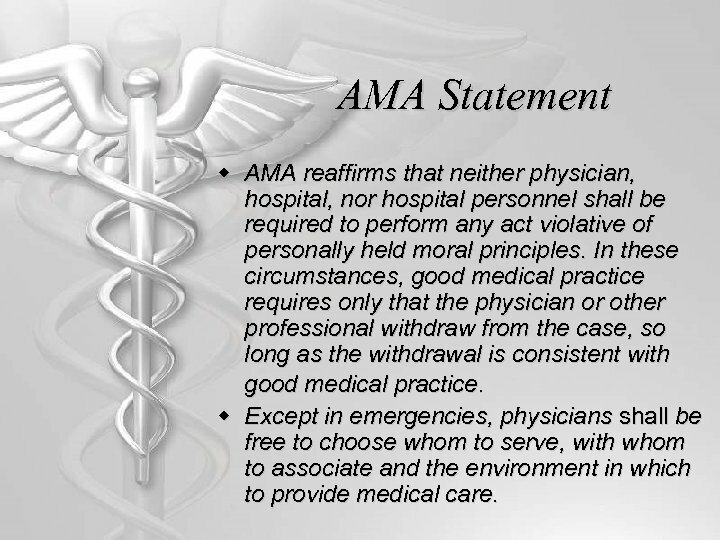 AMA Statement w AMA reaffirms that neither physician, hospital, nor hospital personnel shall be required to perform any act violative of personally held moral principles. 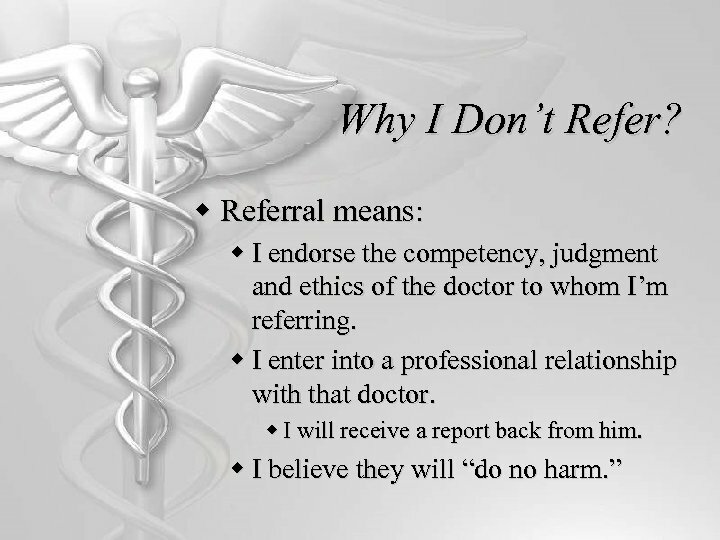 In these circumstances, good medical practice requires only that the physician or other professional withdraw from the case, so long as the withdrawal is consistent with good medical practice. 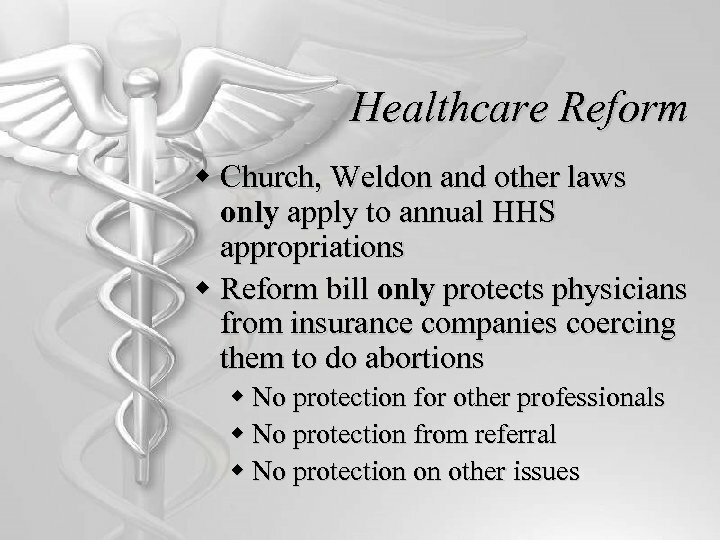 w Except in emergencies, physicians shall be free to choose whom to serve, with whom to associate and the environment in which to provide medical care. 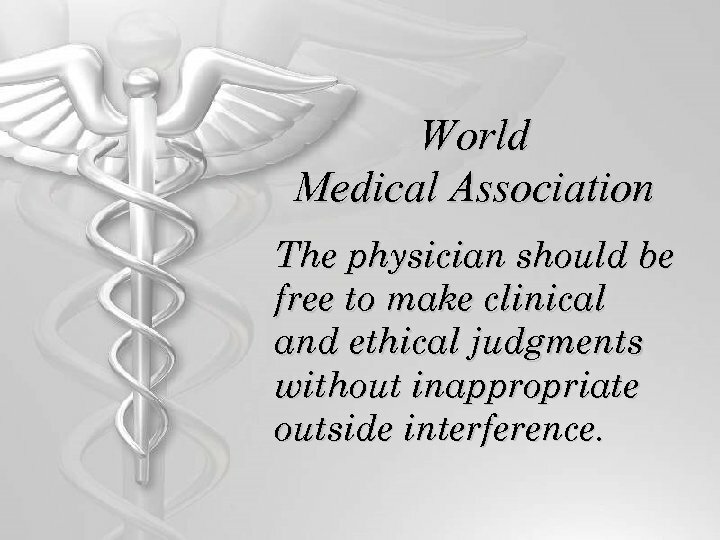 World Medical Association The physician should be free to make clinical and ethical judgments without inappropriate outside interference. 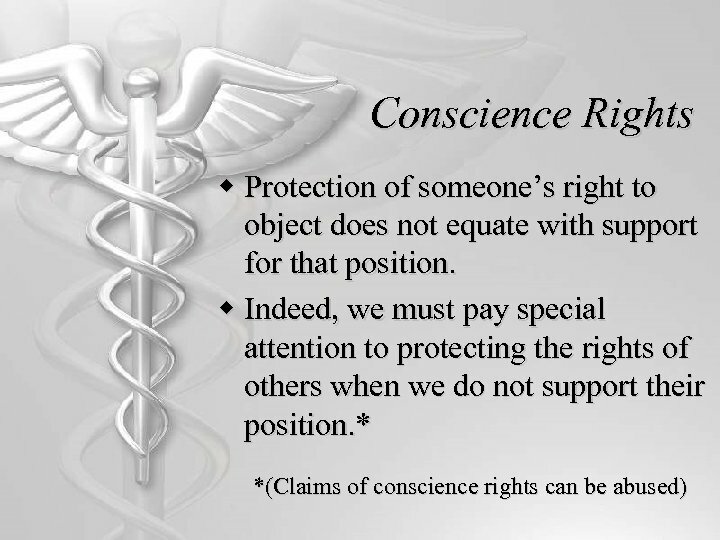 Other Countries/Codes w European Convention on Human Rights w Everyone has the right to freedom of thought, conscience and religion; this right includes… freedom …to manifest his religion or belief in worship, teaching, practice and observance. 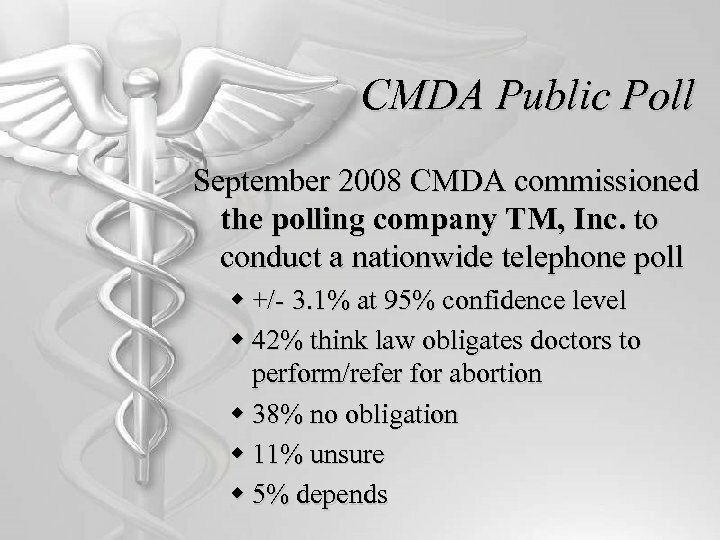 w Canadian Medical Association w Physicians who object to abortion for reasons of conscience are advised to inform their patients of their objections so that the patient can consult another physician. 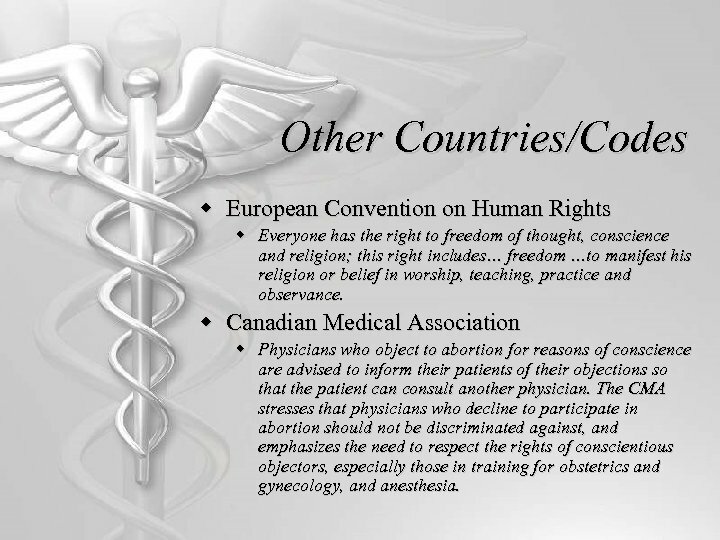 The CMA stresses that physicians who decline to participate in abortion should not be discriminated against, and emphasizes the need to respect the rights of conscientious objectors, especially those in training for obstetrics and gynecology, and anesthesia. 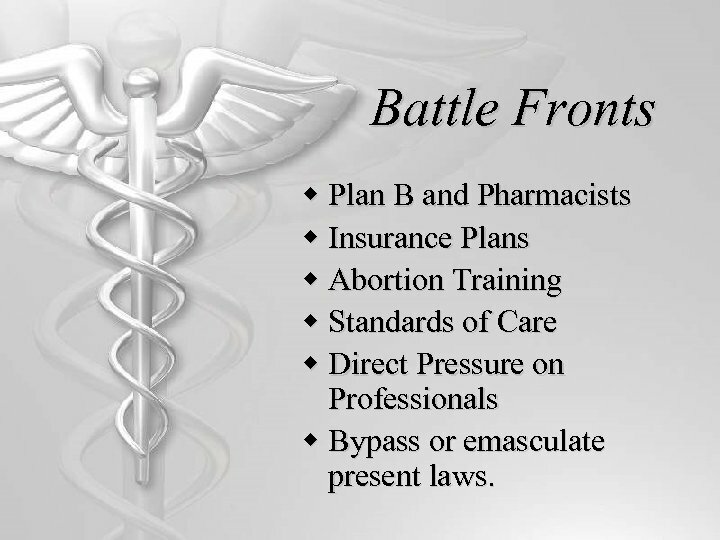 Battle Fronts w Plan B and Pharmacists w Insurance Plans w Abortion Training w Standards of Care w Direct Pressure on Professionals w Bypass or emasculate present laws. 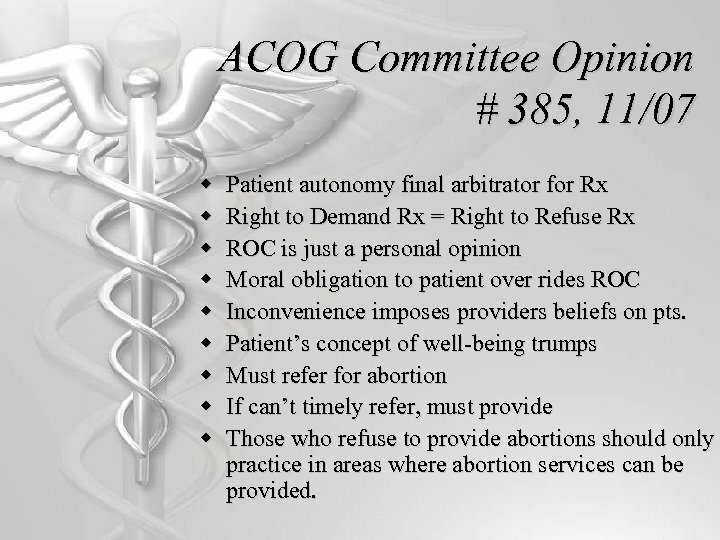 ACOG Committee Opinion # 385, 11/07 w w w w w Patient autonomy final arbitrator for Rx Right to Demand Rx = Right to Refuse Rx ROC is just a personal opinion Moral obligation to patient over rides ROC Inconvenience imposes providers beliefs on pts. 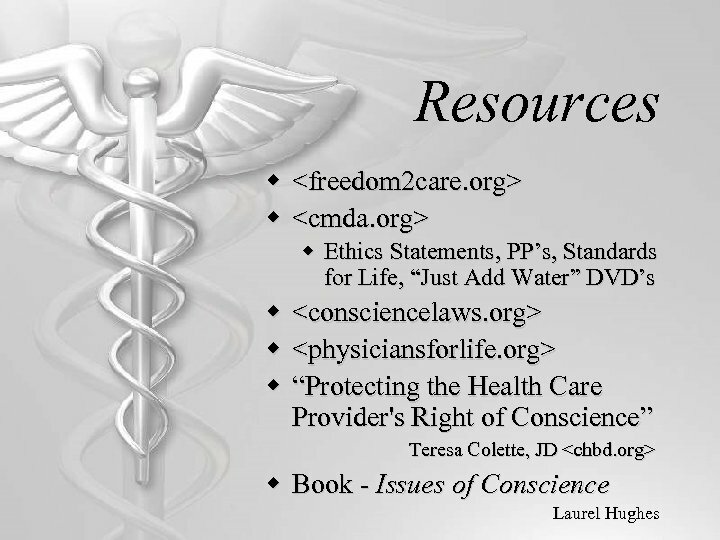 Patient’s concept of well-being trumps Must refer for abortion If can’t timely refer, must provide Those who refuse to provide abortions should only practice in areas where abortion services can be provided. 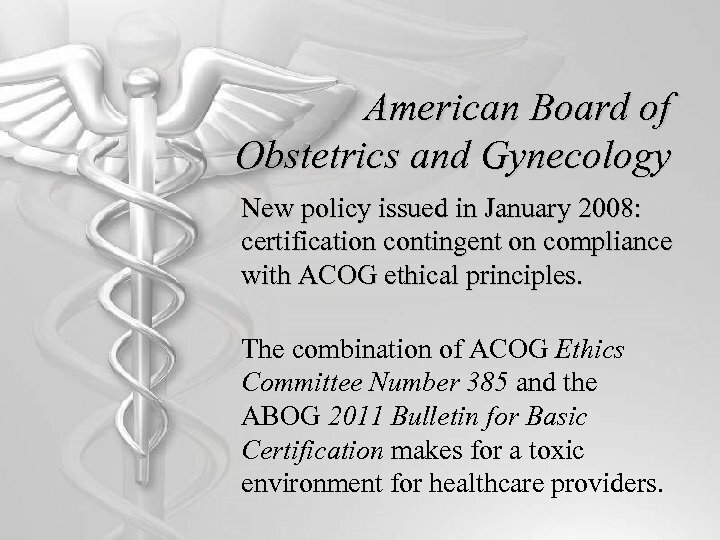 American Board of Obstetrics and Gynecology New policy issued in January 2008: certification contingent on compliance with ACOG ethical principles. 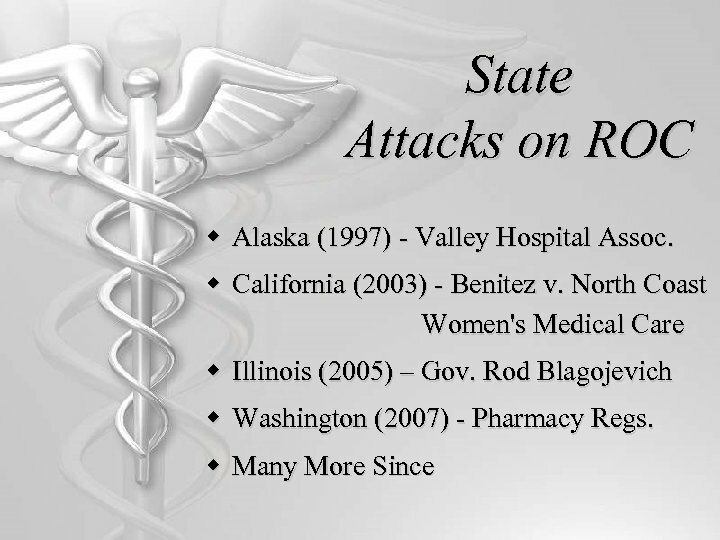 The combination of ACOG Ethics Committee Number 385 and the ABOG 2011 Bulletin for Basic Certification makes for a toxic environment for healthcare providers. 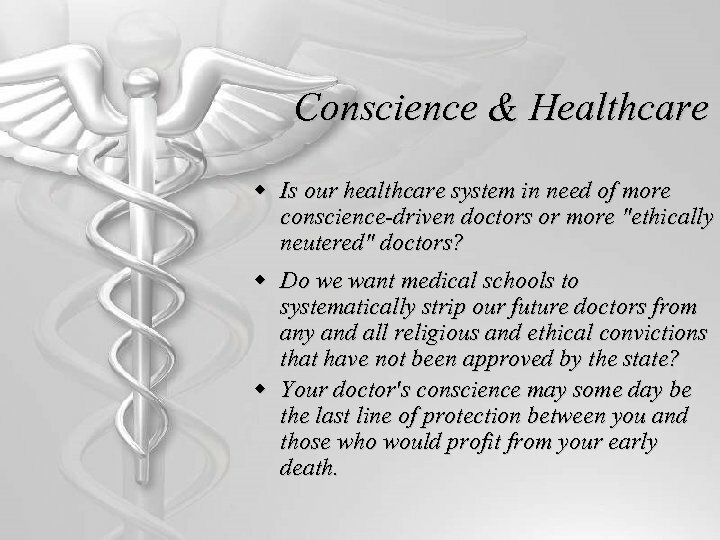 Conscience & Healthcare w Is our healthcare system in need of more conscience-driven doctors or more "ethically neutered" doctors? 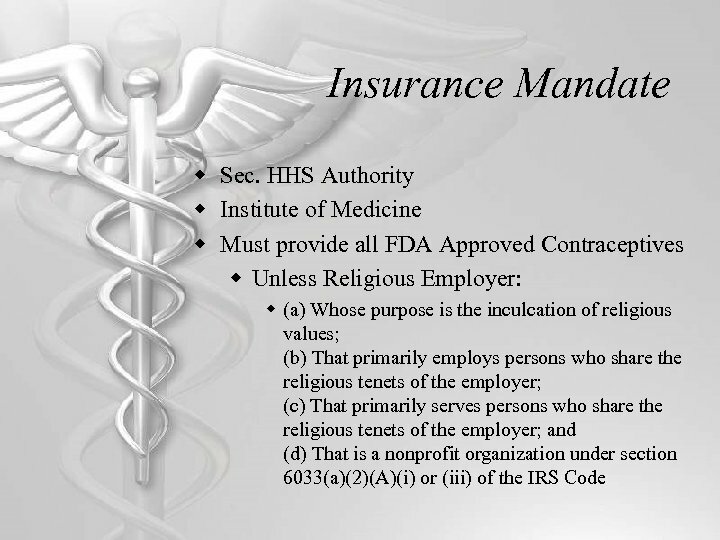 w Do we want medical schools to systematically strip our future doctors from any and all religious and ethical convictions that have not been approved by the state? 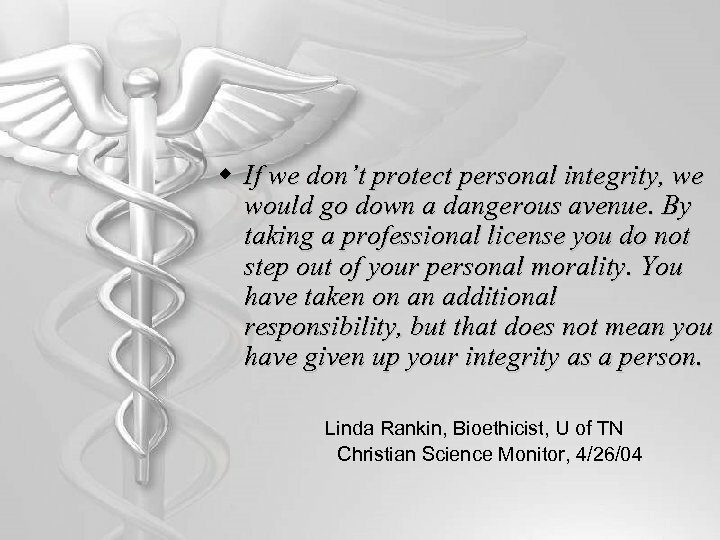 w Your doctor's conscience may some day be the last line of protection between you and those who would profit from your early death. 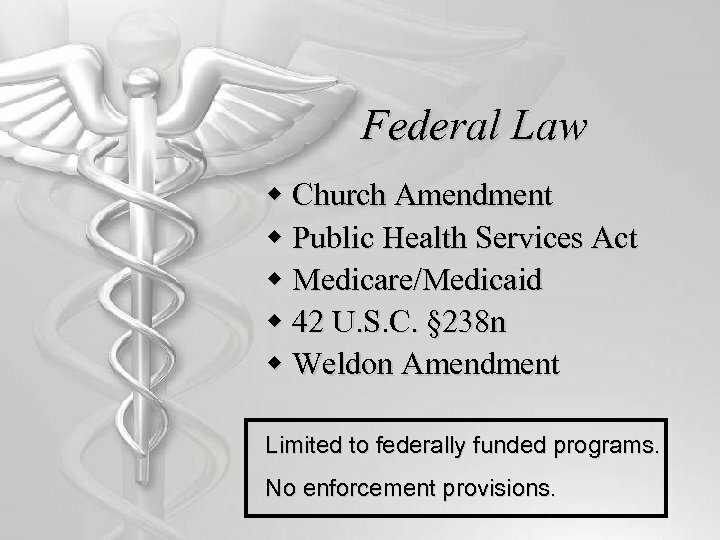 Federal Law w Church Amendment w Public Health Services Act w Medicare/Medicaid w 42 U. S. C. § 238 n w Weldon Amendment Limited to federally funded programs. 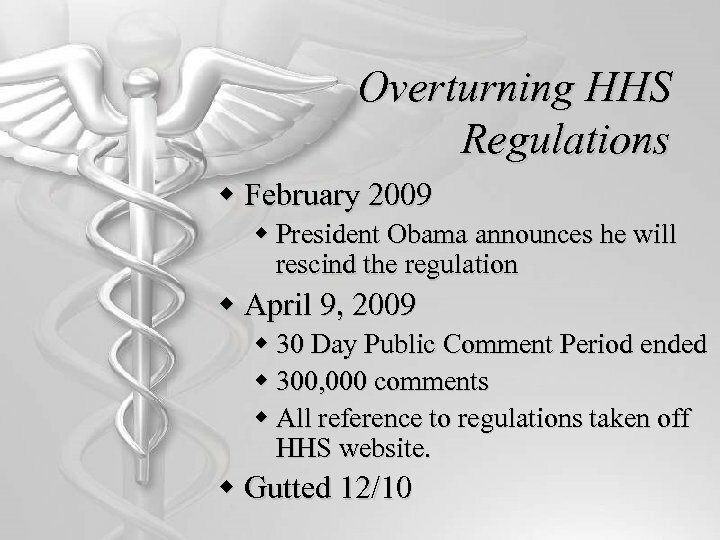 No enforcement provisions. 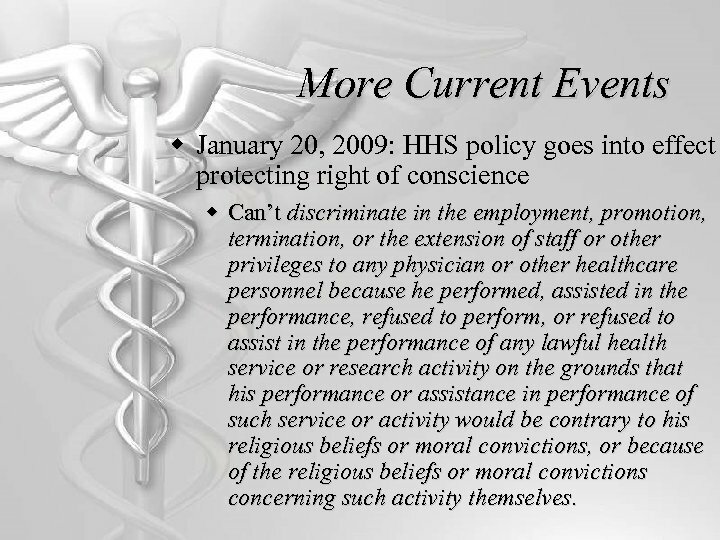 More Current Events w January 20, 2009: HHS policy goes into effect protecting right of conscience w Can’t discriminate in the employment, promotion, termination, or the extension of staff or other privileges to any physician or other healthcare personnel because he performed, assisted in the performance, refused to perform, or refused to assist in the performance of any lawful health service or research activity on the grounds that his performance or assistance in performance of such service or activity would be contrary to his religious beliefs or moral convictions, or because of the religious beliefs or moral convictions concerning such activity themselves. 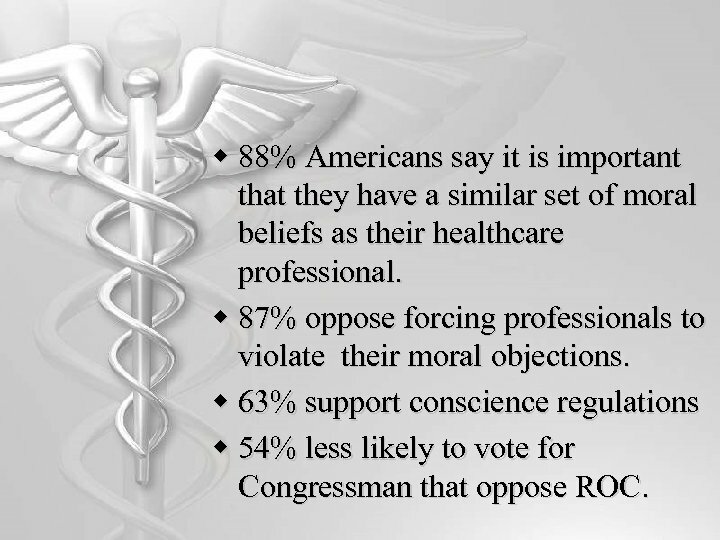 w 88% Americans say it is important that they have a similar set of moral beliefs as their healthcare professional. 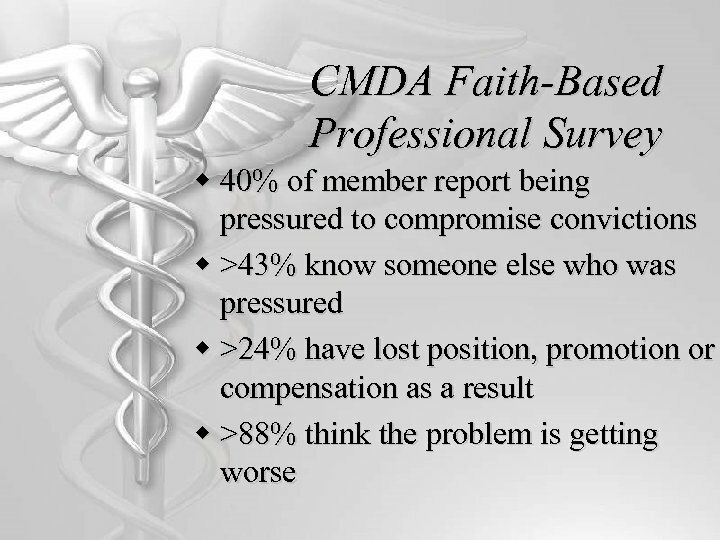 w 87% oppose forcing professionals to violate their moral objections. 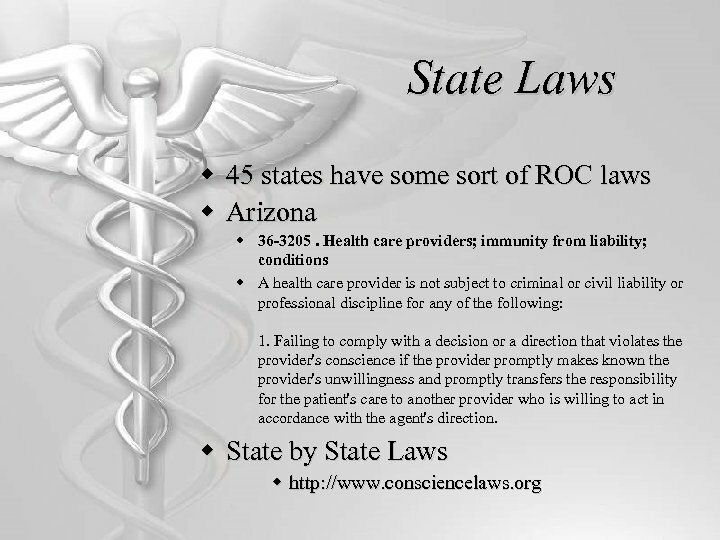 w 63% support conscience regulations w 54% less likely to vote for Congressman that oppose ROC. 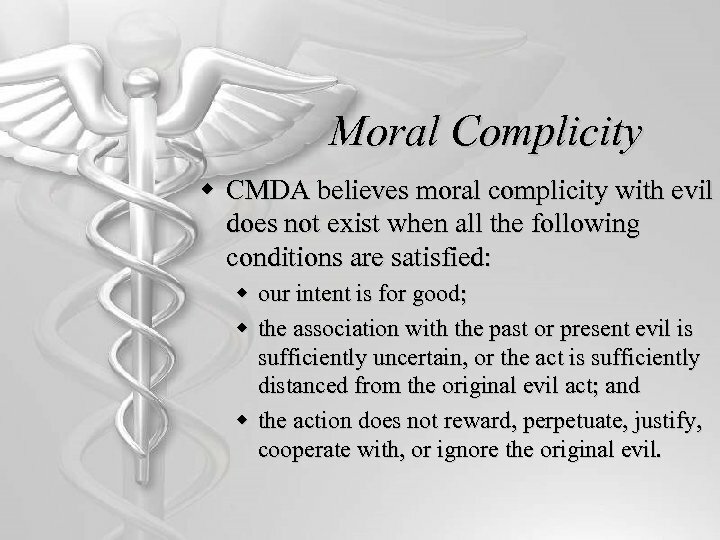 Moral Complicity w CMDA believes moral complicity with evil does not exist when all the following conditions are satisfied: w our intent is for good; w the association with the past or present evil is sufficiently uncertain, or the act is sufficiently distanced from the original evil act; and w the action does not reward, perpetuate, justify, cooperate with, or ignore the original evil. 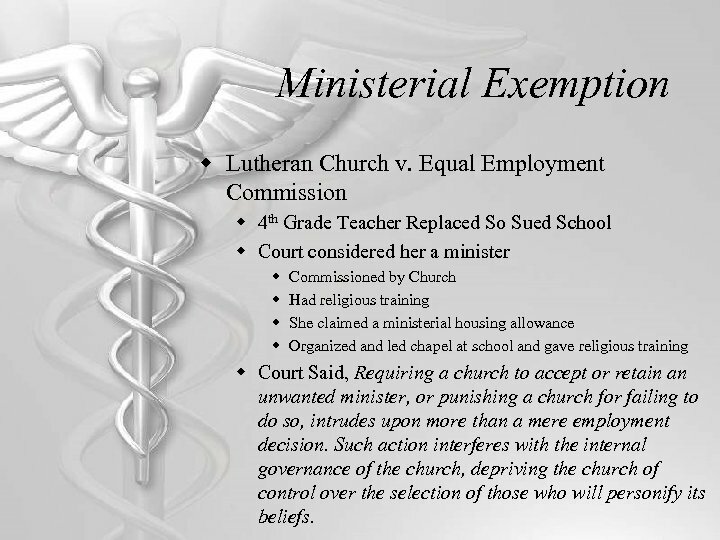 Ministerial Exemption w Lutheran Church v. Equal Employment Commission w 4 th Grade Teacher Replaced So Sued School w Court considered her a minister w w Commissioned by Church Had religious training She claimed a ministerial housing allowance Organized and led chapel at school and gave religious training w Court Said, Requiring a church to accept or retain an unwanted minister, or punishing a church for failing to do so, intrudes upon more than a mere employment decision. 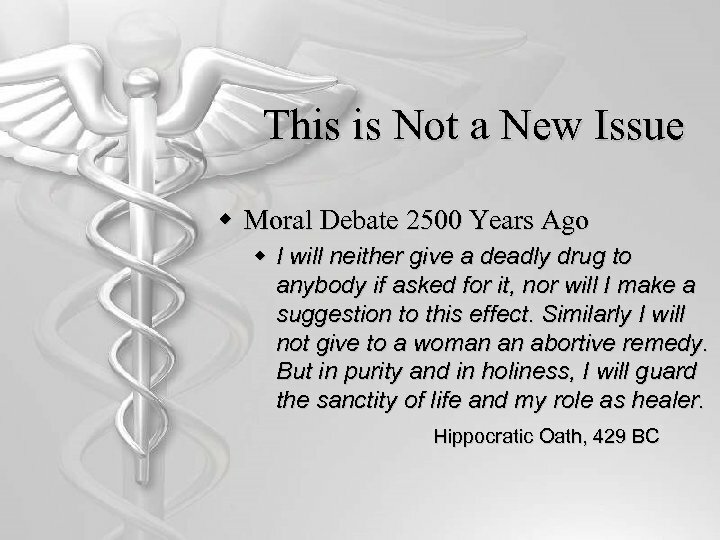 Such action interferes with the internal governance of the church, depriving the church of control over the selection of those who will personify its beliefs.